Mechanoids & Automatons — What's O.L.D. is N.E.W. Simply at the "mechanoid" creature type to an existing animal (see animals) create robotic versions of animals, such as robobears and robowolves (shows as examples below). Mechanoid creatures are immune to mental attacks, and vulnerable (1d6) to electricity damage and (2d6) to ion damage. Ion damage is specially designed to attack electronics and mechanoids. They are usually immune to the Bleeding, Nausea, and Tiredness status tracks. A hivemind of mechanoids intent on assimilating the universe. Adaptive forcefield. An assimilator can only be damaged by each energy type once. Once it has been damaged by a particular energy type (heat, cold, electricity, etc.) its forcefield adapts, rendering it immune to that energy type. This applies on a "per encounter" basis; the immunity is not permanent. Assimilate. If a victim is reduced to zeo HEALTH, the assimilator can inject it with nanites which turn it permanently into an assimilator under the hive's control. Hive mind. Assimilators operate more efficiently when in groups. Every additional assimilator beyond the first within 30' effecibely counts as flanking/crossfire , andgrants +1d6 to all attribute checks, to a maximum of +3d6. Integrated scanner. Assimilators have scanners integrated into their circuitry. Lifesense. Because of their enhanced, multi spectral vision, scouter drones can sense and effectively see living creatures to a distance of 40’ even through darkness, cover, concealment, etc. Called shot. The explorer drone’s eyestalks and antennae are about the only unarmored portions of the creature. A called shot can severely hamper the mechanoid’s sensory systems. A successful hit bypasses SOAK. If it deals 5 or more points of damage, an eyestalk antenna is severed. Destroying one of the creatures’ antennae hampers its live link to the Entity’s hive tree and inflicts the Confused status on the creature (it can shake this off normally). Nanite infection. If a drone should score a bite attack, it injects nanite ‘markers’ into the victim’s bloodstream, which attract biomech hunters. Conversion factories for alien machines. Called Shot. An individual vine can be targeted with a called shot. The vine does not have any SOAK, and 10 slashing damage is enough to sever it, freeing any victims. The hive tree has many vines, so severing one does not otherwise reduce its capabilities. Many vines. A hive tree has an extra action for its size; unlike most creatures who cannot use an action more than once per turn it is able to use all three of its actions to a ack, although no more two attacks can be directed at a single target. Grab. Hive trees can grab their opponents with a melee attack using a vine. A creature struck by the grab attack is Restrained and remains so until escape (whihc requires a melee attack against the hive tree). Conversion. A hive tree can make a melee attack against a large-sied or smaller grabbed target to drag it into a conversion pod. The victim begins to drown in the nanite-infused conversion solution (fast END countdown). Escape requires a single melee attack against the reinforced biomaterial which does 20 damage. The hive tree’s SOAK does not apply, if attacked from within. If the victim drowns, the creature is effectvely killled and converted. Arachnoid harvesters which gather prey for their Hive Tree. Nanites. The hunter’s bite attack contains the first stage in conversion nanites, which steadily override the victim’s central nervous system and inflict the Pain condition. Filament. An hunter’s web attack is a 6d6 ranged attack (range 6) which Restrains a medium sized target or smaller. The filaments are flammable and can be burnt off, but this causes 2d6 heat damage to the trapped creature. They can also be dissolved with alcohol. Lifesense. Because of their enhanced, multi spectral vision, hunter drones can sense and effectively see living creatures to a distance of 40’ even through darkness, cover, concealment, etc. A hunter will concentrate its attacks on those who have been injected with the scouter drone’s marker nanites before it attacks anyone else. Tiny swarms of persistent, aggressive flying drones. Draw a bead. Blaster drones do not suffer a penalty for firing into melee. Cluster fire. Four blaster drones can create the corners of a 30' wide square and direct their fire to cover the area within that square; all targets are subject to an area attack. Philosophical brass men cursed with self-knowledge. Always prepared. Brass golems have brilliant tactical minds, and are always prepared. The brass golem may declare a single action which it took prior to the encounter (even if it didn't know the encounter was going to take place) which helps it in this exact scenario. This must be an action it was capable of. Master linguist. Brass golems can read, understand, and speak any language, including languages new or previously unknown to them. Analytics. Studying its target's behaviour, the brass golem notices a pattern to its actions. It grant all allies within 30' a +1d6 bonus to attack the target until the start of its next turn. Clockwork repair droids who harvest body parts. Poison. The clockmens' needle attack contains a paralytic poison, as they like to store victims before harvesting them. A creature reduced to 0 HEALTH by a clockman's needle poison is permanently paralysed, but is not unconscious. A minor medical task is needed to remove this condition. Clockwork. As clockwork mechanoids, clock men are not vulnerable to electricity or ion damage like other mechanoids are. Repair. Clockmen can repair themselves in a patchwork fashion to the amount of 2d6 HEALTH by spending two actions and resources from their environment. Augment. Clockmen can spend two actions to take and affix a body part from a fallen creature, gaining one of the creature's attribute scores. They can only do so with creatures of the same approximate size (Medium). Wind-up. Clock men can spend two actions winding themselves up. For the next minute, they move at a faster speed (making a rapid clockwork ticking noise while they do so), gaining an extra action each turn, but at the end of the minute they wind down and cannot act or move for one hour. Towering metal golem which dominates the skyline. Grab. The colossus can grab its opponents in its mighty fists. A creature struck by the grab attack is Restrained and remains so until escape, requireing a melee attack against the colossus. It cannot leave the colossus' square or use weapons larger than size small. The colossus can grab two victims of size enormous or smaller (one in each fist). Grabbed victims are automatically crushed for for 6d6 crushing damage at the start of their turn. Roar. The colossus can unleash a roar so loud that its victims are stricken with fear. A roar is an 8d6 mental attack, and attacks any creature in a Burst 16. Victims successfully attacked are made Afraid. Hate-filled floating mechanical abominations which desire only to kill. Disintegrate. A target reduced to 0 HEALTH by an exterminator's disintegration attack is completely and permanently destroyed. No trace of the target remains. Integrated scanner. Exterminators have scanners integrated into their audio/visual sensors. This means that they are always considered to be using a scanner. Self-destruct. An exterminator reduced to 0 HEALTH explodes, doing 6d6 heat damage to all within 30'. Disintegration ecstacy. When an exterminator disintegrates a living creature, it heals 2d6 HEALTH immediately. Damage modes. An exterminator can use a free action to change its attack from disintegration to any one of heat, cryo, electricity, or ion damage. It can change to another damage type or back to disintegration with a further free action. The ultimate in mechanoid security and battlefield control. Greande barrage. The assault droid can use all its weaponry to blanket an area with massive amounts of ordnance. An area 30' across within 100' (but at least 50' away) is covered in grenade attacks. Expert advisors, doctors, and scientists which are unable to physically interact. Intangible. Holograms are immune to any damage type except for electricity and ion. They cannot be affected by any physical attack, and they cannot physically interact with real objects. Free movement. Holograms can move freely across all terrains and difficult terrains, and are unaffected by environmental features. However, they are unable to pass through solid objects and walls. Immortal. A hologram cannot be killed in the normal way. If reduced to 0 HEALTH, the hologram deactivates, but it remains at 0 HEALTH and recovers it at the normal daily rate. The only way to permanently destroy a hologram is to destroy its CPU, which is located in a computer elsewhere. Robots programmed to seek and kill their targets at all costs. Integrated scanner. Hunter-killers have scanners integrated into their audio/visual sensors. This means that they are always considered to be using a scanner. Designated target. Hunter-killers can be programmed to destroy a specific target. They will not stop until that target is destroyed. Detailed anatomical files. With full databanks of the target's weaknesses, the hunter-killer ignores any SOAK that its designated target possesses. Programming a hunter-killer in this way takes one day. Infiltration models designed to look human. Designated target. Hunter-killers can be programmed to destroy a specific target. They will not stop until that target is destroyed. With full databanks of the target's weaknesses, the hunter-killer ignores any SOAK that the target possesses. Programming a hunter-killer in this way takes one day. Shapechanger. The HK-X is able to change shape to adopt any appearance, although its size must remain medium. It has full programming protocols for acting and bluffing, and can also manifest simple melee weapons. Designated target. Hunter-killers can be programmed to destroy a specific target. They will not stop until that target is destroyed. With full databanks of the target's weaknesses, the hunter-killer ignores any SOAK that the target possesses. Programming a hunter-killer in this way takes one day. The HK-TX can maintain a datafile of up to 10 targets. Sturdy robots designed for lifting and crushing. CALLED SHOT. Industral robots are not build for combat, and they have easily targeted access ports. A called shot with a piercing or ballistic weapon to an industrial robot's accesss port, located on the lower back of the mechanoid, will immediately shut it down for five minutes. Industrial mechanoid. Industrial models are specially protected against accidents, and are not vulnerable to electricity damage and ion damage like other mechanoids are. Lifter. Industrial mechanoids can lift double the normal weight for their size (include above). Programmable. Anybody who gets access to the robot's programming can reprogram it with a Challenging  LOG check. This takes 2d6 minutes. Metal witchoil-powered constructs which follow simple commands. Witchoil leakage. Iron golems are powered by witchoil. This necrotic substance starts to leak from the golem's body once it is reduced to half (40) HEALTH, and splashes onto targets hit by the golem for an additional 1d6 acid damage. When the golem is destroyed, witchoil sprays everywhere, doing 1d6 acid damage to everyone within 10' of the golem. The acid seeks into joints and gaps in armor, ignoring SOAK. Hurl object. The golem can pick up a nearby object of size large or smaller and fling it at a target. Stone guardians of ancient tombs. Remorseless. Living statues are immune to all condtions. A cloud of invasive microscopic robots. Swarm. A swarm is immune to all attacks except for area attacks. When it attacks, it simply moves into the target's square. Any creature which starts its turn in or enters the insect swarm's square suffers 1d6 piercing/electricity damage automatically. Swarms can move through gaps of any size. Variable size. Swarms can be of any size. The stats above are for a medium-sized swarm. For each size category larger, the swarm gains +1d6 to damage (i.e. an enormous-sized swarm does 3d6 damage). Mechanized spiders often used as guards. Poison. The robo-attercop's bite attack contains a paralytic poison. Each successful bite renders the victim Slowed. Web. 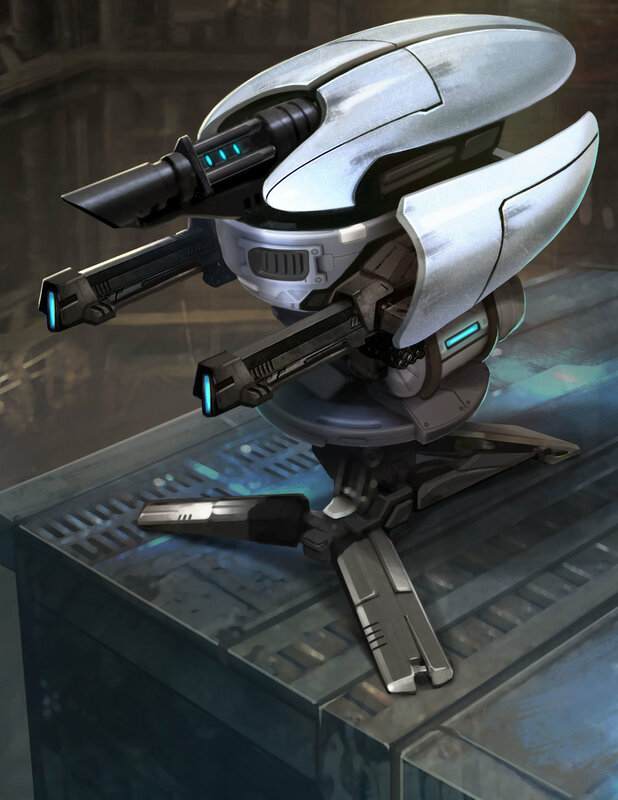 A robo-attercop's web attack is a ranged attack which Restrains a medium sized target or smaller. The web is not flammable and cannot be burnt off. Death from on high. Attercops can pay 2d6 and drop down on their opponent from at least 5' above him, making a bite attack. This counts as a charge but knocks the opponent prone and does 2d6 extra damage instead of 1d6. Bearhug. The bear grabs its target with both arms, squeezing it. It can only bearhug a target of Medium size or smaller. Once established, it inflicts 4d6+5 crushing damage each round automatically, and can move at half speed, carrying its victim. It takes a melee attack action with a one-handed size small or smaller weapon to escape the bearhug. The bear may not make claw attacks while hugging a victim, and will not usually use this attack while being attacked by multiple foes. Knockdown. Targets smaller than the robobear hit with a claw atatck are knocked prone. Mechanical snake designed to crush its prey. Constrict. A creature which is hit by the snake's constriction attack is Restrained until it can shake off the condition. The snake can only constrict one victim at a time, and once it has successfully struck a victim, the victim takes 4d6+5 crushing damage automatically at the start of its turn. The snake cannot move while constricting a victim. Reptilian king of the dinosaurs - in robot form! Charge. Once per turn, the robo-rex can move its speed in a straight line and then attack at the end of it, all as a single action. It gains +1d6 damage to its attack. Roar. The robo-rex can unleash a roar so loud that its victims are stricken with fear. The roar affects a Burst 12 (60') and does sonic damage to those it successfully hits. Tail swipe. The robo-rex has a tail swipe attack. This attack affects all targets in a 15' cone to the rear of the creature. In addition to damage, the target is knocked prone if it is a size category smaller than the robo-rex. Mechanical guard dogs and remorseless hunters. Dart In. Move SPEED 6, attack, then move SPEED 6 back again. Pack attack. Each additonal ally adjacent to the target grants +1d6 to attack. Remorseless tracker. Once a robowolf starts tracking a target, it will never stop. It will continue to chase the target, without tiring, until either the target or itself is destroyed, without exception. Often, robowolves used as guard dogs are programmed to enter hunt-and-destroy mode upon detection of an intruder, making them an extermely effective deterrent. Robowolves will chase vehicles across an entire continents in pursuit of a target. Expendable robotic guards and soldiers.